Every day Reformy John King peered into his magic mirror and asked, "Mirror, mirror on the wall, who's the reformiest one of all?" 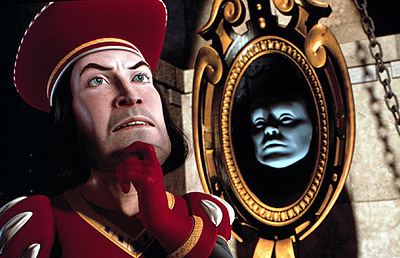 Inevitably the mirror would answer, "You're reformy, this I like, but reformier still is Emperor Mike." Reformy John was sad. What can I do to be as reformy as Emperor Mike, he wondered. And furthermore, does an emperor outrank a king? Despite these engrossing ruminations, every morning it was the same. "Reformy yes, this you can do, but Mike's reformier than you." Then one day, the evil UFT Guild got into the act. They said they too would get reformy, but only if they could collectively negotiate exactly how reformy they could be. They met with Emperor Mike, who cried, "Not reformy enough!" and sent them on their way. But Genghis Cuomo from the North was displeased, and told the UFT Guild that they would get reformier or he would take all the ice cream away from the little children in the UFT Guild's village. "Fie on you," said Sir Mulgrew of the UFT Guild to Genghis Cuomo. True to his word, Genghis Cuomo blocked delivery of 240 million bucks worth of ice cream. The village children were deeply saddened, and Baron Rupert of Murdockistan dispatched town criers throughout the land to call the UFT Guild a bunch of swine, and to further declare that Sir Mulgrew did not want the children to have any more ice cream. Reformy people everywhere were displeased. Who could help them? Genghis Cuomo decreed that both the UFT Guild and Emperor Mike could issue plans on how to get reformy. And then, Genghis Cuomo decreed that Reformy John could pick the plan that suited him best. And the reformy people rejoiced. And thus, Reformy John decreed that Emperor Mike's plan was the reformiest ever, and made it the law of the land. That night, Reformy John peered into his magic mirror, and asked, "Mirror, mirror on the wall, who's the reformiest one of all?" The mirror paused for a second, looked Reformy John in the eye, and answered, "You are one reformy Dude, the UFT Guild's surely screwed. Term limits mean Mike's hit a wall, and you're reformiest of all." And all the people lived happily ever after. Except the UFT Guild, the village students, and anyone else who faced the prospect of working for a living.